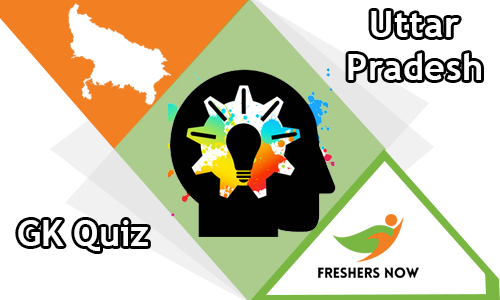 Uttar Pradesh GK Quiz is available here in this post. In this page, we are providing you the Gk Questions on Uttar Pradesh which helps you in your competitive exams. And as well as for your General Knowledge. And we have provided you the Uttar Pradesh Details and Examination Details how to write exam either by online or by written as mentioned below. Additionally, we are providing the Uttar Pradesh GK Quiz Questions and Answers in a clear manner. And by writing this Uttar Pradesh GK Quiz what are the Benefits that also mentioned below. And the Uttar Pradesh GK Quiz Questions results will be provided according to the participant submission of the Quiz within the time limit. Moreover, we are providing you the additional information regarding the Uttar Pradesh GK Quiz Question and Answer. Therefore, using the help we provided in this page, an aspirant can easily prepare for various competitive exams. This page will help you in all the ways. Like the candidate wants to know their answer after submitting the test the answers will be provided and with good and clear explanation manner. So we think this is the right opportunity for you to gain good knowledge and improve your skills in your Gk. So that interested people can take this Uttar Pradesh GK Quiz. 1. Which is the capital of Uttar Pradesh? 2. Who of the following prime ministers of India was not born in Allahabad? 4. When was Agra Presidency separated from Bengal Presidency? 7. Which of the following pairs is wrong? 14. Which is the official language of Uttar Pradesh? 15. Which was the headquarters of the Nagas in Uttar Pradesh? 16. Who of the following prime ministers of India was not born in Uttar Pradesh? 17. When did the British annex Oudh? 18. By what name was formerly known as Uttar Pradesh? 19. When was the Uttar Pradesh Panchayat Raj Amendment Act passed? 20. How many members can be the district planning committee? 21. Which is the biggest railway station in Uttar Pradesh? 22. When was Uttaranchal separated from Uttar Pradesh? 23. What is a percentage of male literacy according to 2011 census in Uttar Pradesh? 24. Which of the following institutes is situated in Agra? 25. In which of the following places is the oil refinery in the State situated? Uttar Pradesh was a state which was formed in the year 1950 on January 24. And the capital of Uttar Pradesh was Lucknow which consists of 75 Districts. The Governor of Uttar Pradesh was Ram Naik and the Cheif Minister of that state was Yogi Aditya Nath(BJP). He was a member of BJP party. The languages that are used in Uttar Pradesh are Hindi and Urdu. Uttar Pradesh is also known as Heart of India. And also Uttar Pradesh is famous for the two gods Lord Rama and Lord Krishna birthplaces and it also attracts the people because of Taj Mahal. It is one of the New Seven Wonders of the World in Agra i.e located in Uttar Pradesh. And the matter is mentioned because it will be useful for your Uttar Pradesh GK Quiz. By taking this Uttar Pradesh GK Quiz on online each and every one can improve your skills and it will be like a mock test. This Quiz will be like a Practice Test for your Competitive exams and it will help you to boost up your confidence levels. By taking this Quiz you can become Knowledge hubbers also that is everything you can able to solve the states. But it is possible when you thoroughly prepare for your final exams by taking this practice exam. The results will be released soon according to the submission of the candidate within the given time and the marks will be given according to their answering of Quiz. I think this page will acts as a mock tets like your Emcet. And this Mock Test will help you get good marks in your competitive exams and also increases your level skills These are some of the websites which also helps you to know some of the information about Uttarakhand. Such as shown here Uttar Pradesh Gk Quiz and Answers, Uttar Pradesh mcq, Quiz On Lucknow, etc. And for any other information visit our website Freshersnow.com.